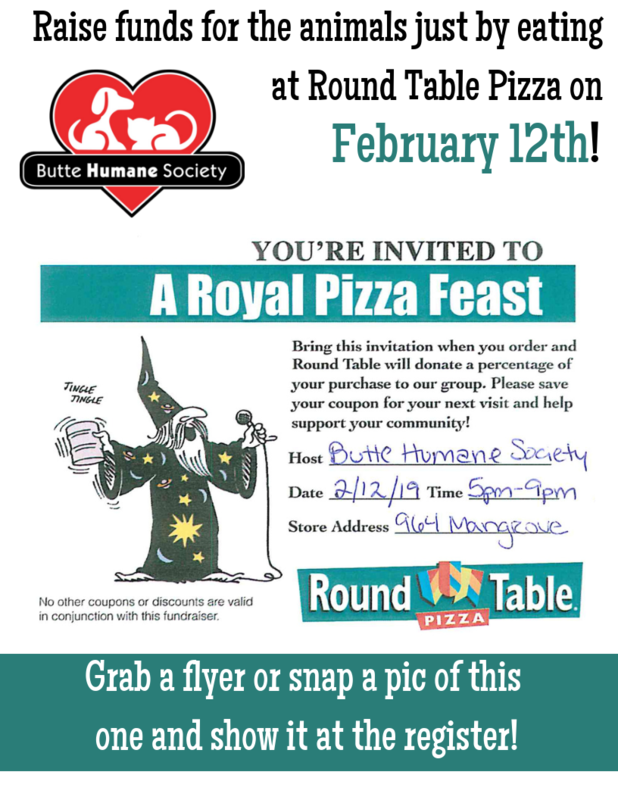 Join us on Tuesday, February 12th at the Round Table Pizza on Mangrove to enjoy a delicious pizza, while also supporting Butte Humane Society! Time to chow down & help homeless animals in the process! Butte Humane Society’s Supper Club serves to support our mission of saving lives, finding homes, and inspiring compassion within our community. Join us the first Wednesday of every month at one of our local restaurants for a “four paw” dining experience. Each of the following restaurants have pledged to donate 15% of the sales made that day to Butte Humane Society. Not only will you fill your belly, but your heart will be full of good karma!